The ‘Stony Stratford Healthcheck’ studied the relative qualities of this market town by an examination of the economic, social and civic facilities which exist. This examination was documented by a combination of professional assessors and volunteers, from information provided by those who worked and lived in the parish and those who visited for whatever reason. The ‘Stony Stratford Futures Group’ was officially proposed in 2006, by a public open meeting, where a group of residents volunteered to implement some of the recommendations made in the healthcheck. This of course would simply have been a talking shop had it not been for the determination of the group and the possibility of grants being available to finance these imaginations. The major drive was for projects which enhanced the heritage character of the town and the surrounding environs. This provided very suitable ammunition for a viable bid to be made for funding. Eventually a grant was provided by ‘South East of England Development Agency’ (SEEDA) and the group was able to proceed. A constitution was adopted and a steering committee elected. A list of proposals was assembled from suggestions made by the steering group, local organisations and those who showed interest. From these a formal list of definite projects was produced, the list is available in Stony Stratford library but too extensive to reproduce here, with programmes and estimates. 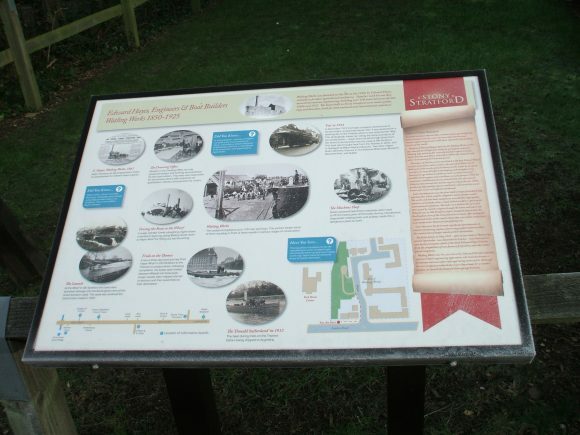 The riverside and town walk information boards. The town direction signs and maps. The provision of benches in the town. 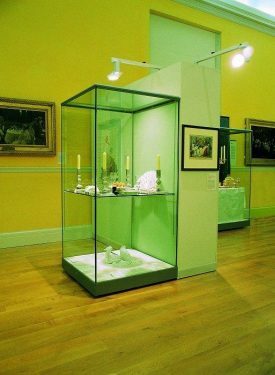 The provision of MK Museum display cases in the library. The provision of historic information plaques. The de-cluttering of the High Street. The removal/replacement of damaged direction and road signs. The configuration of High St. traffic patterns and paving. Towards the end of the group’s activity it was asked to administer the implementation of a ‘Public Art’ project which was financed from Section 106 monies gained by MK Council for the residential development of ‘Hayes Mews’ off the London Road. This was implemented as a sub-committee of the main group and managed by volunteers from interested parties. The land belongs to MKC and will become public open space when the development is complete. It is substantially a grassed area with many mature trees which are protected by a tree preservation order. It was the site of ‘Hayes Agricultural Engineering Works’ which existed in the late 19th C and early 20th C. The main claim to fame being that it was also a boat building company with clients around the world. These boats were transported up the High Street to Old Stratford, by tractor and trailer, to be launched sideways into the canal. Some were taken to London and tested on the Thames, eventually being delivered to clients from India to South America. It was therefore thought to be a very suitable subject for the public art project, the resultant sculptures can be seen on the site. The sculptures are reminiscent of the machinery and evoke the shapes typically seen in some of the vessels which were manufactured on the site. The SSFG is still a viable organisation at this date and could be reinvigorated by an injection of new enthusiasm and further projects which could attract grants. It is a worthwhile and enjoyable activity which at worst maintains the viability of carefully nurtured attractions and at best provides new and exciting history of the future.